My wife, Bonnie, recently noticed that the American flag displayed in our front yard on a 15-foot pole was beginning to develop a tatter in the upper corner. My deep respect for our national symbol motivated me to replace the flag with a new one the next day. It also reminded me that Flag Day—June 14 was rapidly approaching. In doing some research into the origin of Flag Day I discovered that June 14 is also the birthday of the founding of the U.S. Army. Flag Day is celebrated on June 14 each year to honor the United States flag and to commemorate the flag’s adoption. Although Flag Day is a nationwide observance, it is not a public holiday in the United States. In a few areas of the USA it is a legal holiday, such as Montour County in Pennsylvania. On June 14, 1777, the Continental Congress replaced the British symbols of the Grand Union flag with a new design featuring 13 white stars in a circle on a field of blue and 13 red and white stripes—one for each state. Although it is not certain, this flag may have been made by the Philadelphia seamstress Betsy Ross, who was the official flag maker for the Pennsylvania Navy. The number of stars increased as the new states entered the Union, but the number of stripes stopped at 15 and was later returned to 13. The American flag is often referred to by its nicknames—“Old Glory” or “Star Spangled Banner”. Flag Day did not become official until August 1949, when President Harry Truman signed legislation and proclaimed June 14 as Flag Day. In 1966, Congress also requested that the President issue annually a proclamation designating the week in which June 14 occurs as National Flag Week. Many people in the United States honor this day by displaying the American flag at homes and public buildings. It is a good time to check your flag to see if it is tattered, faded or in need of replacement. 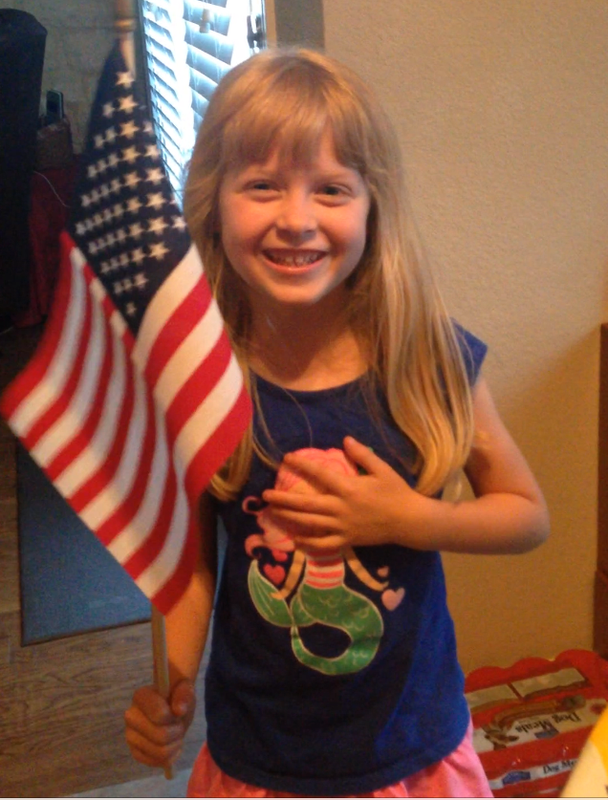 Our daughter who resides in Texas sent Bonnie and me a video of our 5-year-old granddaughter, Emma, reciting the “Pledge of Allegiance” as she held an American flag. Do you remember the words? “I pledge allegiance to the flag of the United States of America, and to the republic for which it stands, one Nation under God, indivisible, with Liberty and Justice for all.” The Pledge of Allegiance was recognized by Congress on June 22, 1942. When the American Revolution broke out, our forefathers did not possess an army in the modern sense. The revolutionaries fielded a patchwork force of colonial troops from various New England militia companies loosely tethered together. There was no unified chain of command, and Artemus Ward of Massachusetts exercised authority by informal agreement.The American volunteers were led, equipped, armed, paid for, and supported by the colonies from which they were raised. In the spring of 1775, this rag-tag army was about to encounter well-trained, well-supplied British troops near Boston, Massachusetts. The revolutionaries had to re-organize their forces quickly if they were to stand a chance against Britain’s seasoned professionals. The Massachusetts Provincial Congress appealed to the Second Congress in Philadelphia to assume authority for the New England army. John Adams requested Congress to vote on adopting the Boston troops on June 14, 1775, although there is no written record of this decision. Also on this day, Congress resolved to form a committee ”to bring in a draft of rules and regulations for the government of the Army,” and voted $2,000,000 to support the armed forces around Boston and New York City. In addition, Congress authorized the formation of ten companies of expert riflemen from Pennsylvania, Maryland, and Virginia, which were directed to march to Boston to support the New England militia. George Washington was appointed as commander-in-chief of the Continental Army the next day, and formally took command at Boston on July 3, 1775.